....when looking at my eligibility page, it states at the bottom that the offer ends on June 23. What does that mean? We are no longer eligible starting June 24th? I believe it expires every month, so you shouldn't have to worry about it. I don't know if many people know this ... but ... If you text the word upgrade to 1311 it sends all your eligibility info you need straight to your phone . Pretty neat, didn't know that. I knew that, I was just wondering about that thing at the bottom that says the Program ends on June 23rd. Sending a text to 1311 with the word "upgrade" did NOT work. June 23 is when Sprints pricing changes will take affect. They expired the 4th of June and run through the 23rd. The window is usually longer but do to the launch of the 3d it changed. That is how I knew the 3d was launching on the 24th. Fortunately according to the people that thanked me for the tip AND this screen shot it DOES work. And the rest of your info is wrong also ... I do understand that they have this "expiration date " printed somewhere but a definitive explanation is nowhere to be found ... 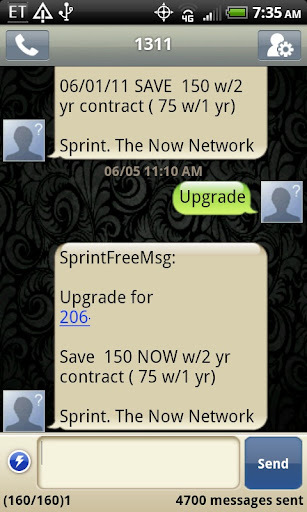 When Sprint makes a MAJOR change in its policies an official announcement/press release accompanies it. How weird, this is how mine came back. Well, mine is a business account, maybe that's why. Got the same answer on the second try. And you are WRONG again. I never stated it was in their policies. I was referring to there in store Price changes on Sprints handsets. You assumed and are incorrect in your response. No need to hit the thanks button. I am afraid you are WRONG, it failed on my phone here is the message. I sent the text correctly. Looks like you texted the message to 9230 and NOT 1311 because everyone else seems to be working just fine ... In any case no need to beef about something like this . Hey, chuckles. Wrong destination number. His instructions work fine. Stop being a belligerent git. No I have a screen shot of the correct destination number. 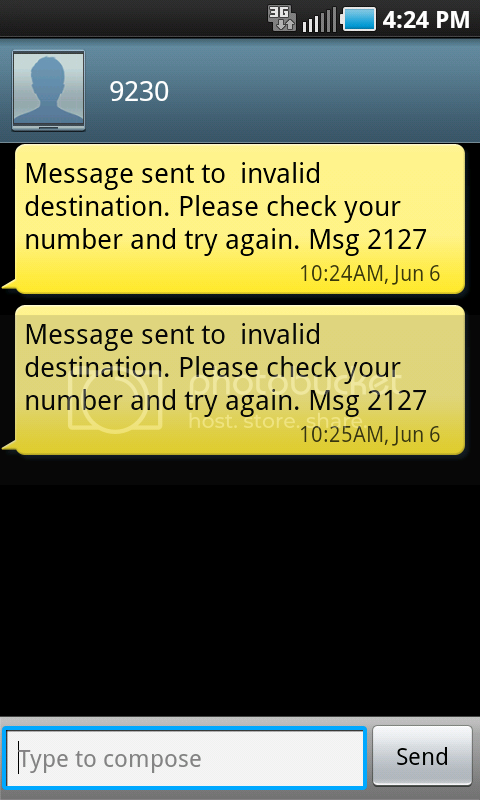 That was the error message came from that number, wanna see the correct message? 1 post, and this is your first post. Sad very sad to create an account for this. Funny mine says "save 75 NOW w/2yr contract (150 w/1yr)"
Do you have a business account too? Yeah, it's on a business account too. That's it then...we get to save more by signing up earlier...what a win/win!